Animal and veterinary clinic flooring can vary greatly depending on the animals and procedures accommodated, but they all have one thing in common: The need for concrete floor coating systems that are impermeable and resistant to animal waste, odor absorption, staining and the harsh cleaners used for sanitation. 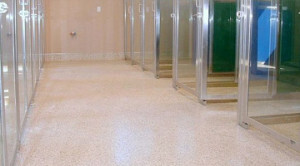 We have one of the largest selections of vet and animal flooring and concrete epoxy floor coating systems on the market. 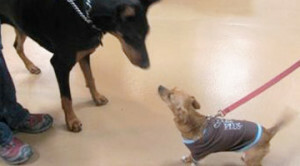 Whether paws, claws or shoes, the traffic in animal facilities is ongoing and abrasive. Veterinary floor coating systems should provide some slip resistance, but never to the detriment of sensitive canine pads. These skid-resistant properties must be well-balanced with cleanability, too—whether in a veterinary practice, a laboratory, or a training or boarding facility, hygiene and pathogen control is high priority. Grout lines and seams in other flooring systems can harbor odors and germs. That’s because unprotected concrete floor slabs are porous, and absorb substances to which they are exposed. Veterinary and animal flooring systems must be seamless and impervious, capable of keeping animal waste, harsh cleaners and disinfectants contained on the surface of the concrete, where they can be disposed of quickly and safely. An integral floor-to-wall cove base and a floor that gently slopes to a drain can be time-savers, especially when hosing down kennels and other areas. Depending on facility flooring structure, our moisture-mitigating systems and waterproofing underlayments can help keep mold, mildew and ground moisture vapor in check. Optional antimicrobial protection can also be incorporated throughout your concrete floor coating systems for added pathogen control. Your facility is one of a kind—your flooring system should be, too. Each of our animal and veterinary flooring systems is custom designed to meet your specific facility requirements. This means that you get the right concrete epoxy floor coating systems or other resin materials, special aggregates, skid resistance and decorative elements, all installed by highly experienced, approved local installers. It’s a total custom flooring solution, designed to address your facility’s unique needs and distinct aesthetics. And with Florock, custom solutions are as affordable as they should be. We’re a privately-owned concrete flooring company with a lean management structure and no shareholders to support—that adds up to bigger savings for you without sacrificing quality. Learn more about our veterinary and animal flooring systems, and how we create custom solutions that fit your facility and your budget.